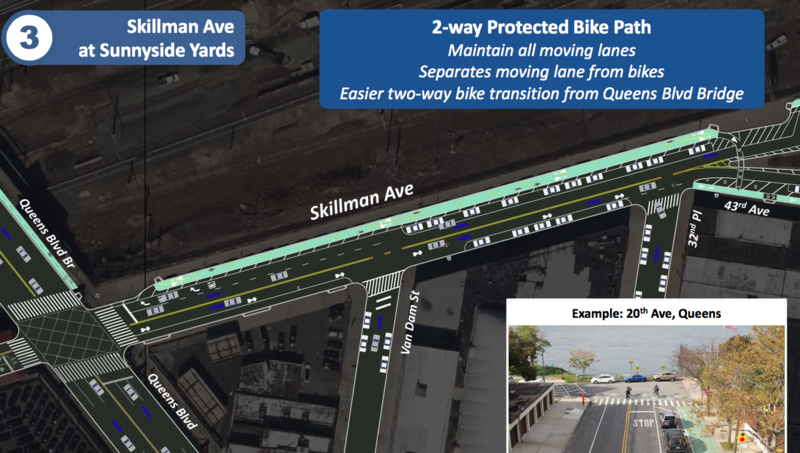 To create safer bike connections between the Queensboro Bridge and the neighborhoods east of Sunnyside Yard, DOT is planning for protected bike lanes on 43rd Avenue and Skillman Avenue. By filling key gaps in the protected bike lane network, the project would create an eight-mile stretch of nearly continuous protected bike lanes connecting Forest Hills to Midtown Manhattan. Agency reps showed the plan to the Queens Community Board 2 transportation committee last night. DOT expects to present the project again before seeking a vote from the CB and is aiming to implement the project next year. In April, a drunk driver killed delivery worker Gelacio Reyes, 32, at 43rd Avenue and 39th Street, as he was biking home from his job in Manhattan. Ten days later a driver critically injured another cyclist at the same location. Advocates and Council Member Jimmy Van Bramer called on DOT to install protected bike lanes on both streets, which are heavily used by people on bikes. DOT’s plan delivers, calling for 2.6 miles of protected bike lanes and 30 new painted pedestrian islands along both streets [PDF]. The only remaining gaps in protection between the bridge and central Queens would be on a few blocks of cross streets near the convergence of Roosevelt Avenue and Queens Boulevard. In the redesign, the busiest parts of each street — Skillman Avenue between 49th Street and 39th Street, and 43rd Avenue between 38th Street to 52nd Street — would get a five-foot parking-protected bike lane with a three-foot buffer. At intersections, painted pedestrian islands would improve visibility and shorten crossing distances. The number of motor vehicle lanes would remain unchanged. On less-trafficked blocks prone to speeding — Skillman Avenue between 56th Street and 49th Street and 43rd Avenue between 32nd Place and 39th Street — there would be one car lane, allowing for a six-foot bike lane, five-foot buffer, and nine-foot pedestrian islands. East of 39th Street, one lane of Skillman would be for moving motor vehicles during the morning rush and parking at all other times. To manage conflicts between turning drivers and cyclists at intersections, the project calls for mixing zones, not DOT’s newer — and presumably safer — intersection treatments. 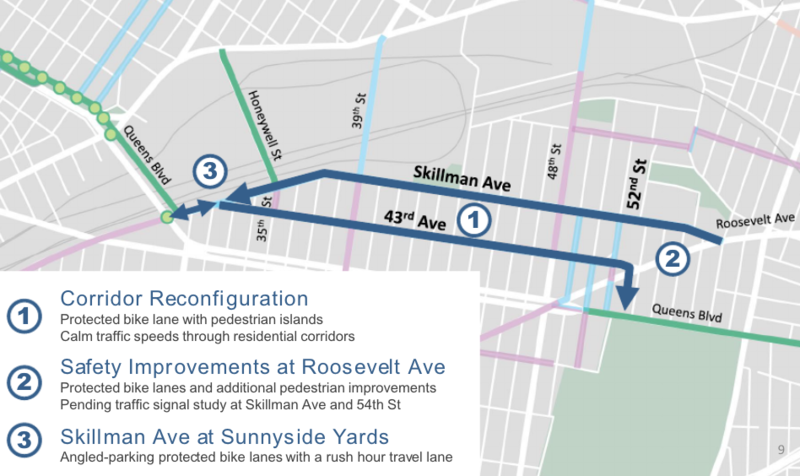 The westernmost leg of the route would consist of a two-way protected bike lane on the north side of Skillman, linking the Queens Boulevard bridge, which spans Sunnyside Yard, and 43rd Avenue. Eastbound cyclists comfortable riding in regular traffic would still have the option of riding in the road, which would maintain its sharrows. DOT striped unprotected bike lanes on Skillman and 43rd in 2008. Cycling on both streets has skyrocketed, increasing 545 percent since 2007, according to DOT. The agency’s 12-hour bike counts over the summer showed more than 1,400 people cycling on the two streets combined. Transportation Alternatives has collected 700 signatures in favor of protected bike lanes on 43rd and Skillman, and letters of support from 42 businesses on both streets. Despite the clear need for safer bike infrastructure, CB 2 leadership was laser-focused last night on the potential loss of parking spaces. Pedestrian islands and mixing zones would replace 118 parking spaces, and 40 other spaces on Skillman would be removed due to changing the degree of angled parking and other adjustments. The rush hour moving lane on Skillman accounts for another 40 spaces, but only from 7 a.m. to 10 a.m.
Banrey said a vote of approval from the board by January would allow DOT to implement the project within months. But Keehan-Smith, who stood with Van Bramer and advocates at the site of the two bike crashes, didn’t see implementation as an urgent priority, citing the complaints the board received after DOT redesigned a segment of Queens Boulevard in 2015. “I don’t want this to be rushed. I don’t want anybody to say, ‘I need an answer by next month,’ because we’re going to say no,” Keehan-Smith said. When I look at the map I’m honestly not understanding the purpose here as a connection from Queens Boulevard to the Queensboro Bridge. Why not just stay on Queens Boulevard instead? The part paralleling the #7 viaduct is actually safer for cyclists than the rest of Queens Blvd. anyway. If need be, put a bike lane there. Bike lanes on 43rd and Skillman Avenues can certainly serve as connections from points north of Queens Blvd. but I’m not seeing the logic of diverting to those streets if you’re already on Queens Blvd. It’s not the straightest line but it’s the easiest lift. The fact that so many people are already using these streets — and getting hurt — shows that it’s a much-needed intervention. I totally agree the bike lanes on 43rd and Skillman are needed. I’m just questioning selling them as a connection from Queens Blvd. to the Queensboro Bridge. The last leg of Queens Blvd. is actually fun to ride along. It’s mostly downhill. With the typical light timing you often don’t hit any reds if you go about 25 mph. In another thread valid points were bought up regarding Skillman Avenue. DOT’s implementation of a bike lane, complete with merging zones, might cause confusion for cyclists. And the light timing right now allows for unfettered 15 mph travel. A protected lane where you have to slow at merging zones would screw that up. Here’s hoping they do this right. This is great proposal. Thanks DOT and CM Van Bremer. 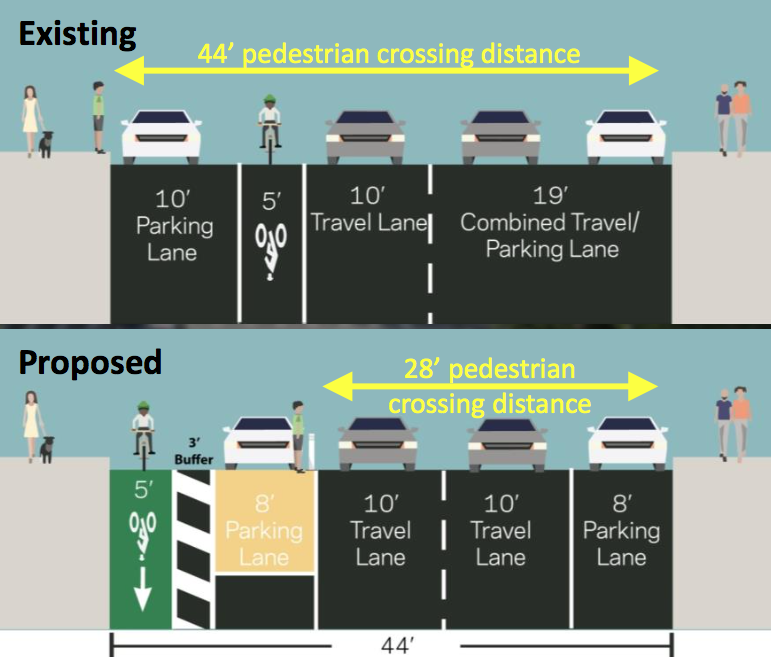 One small question, are the mixing zones/turning lanes in the diagram the same improved design DOT are testing on the Upper West Side of Manhattan? I’m looking at the right hand turn in the diagram and the long mixing zone, which would seem to allow for fast turns. All of the intersections in this redesign have mixing zones. I’m not sure why DOT isn’t trying newer intersection designs in this project. And you could put a protected bikelane on one of both sides alongside the elevated rail line without even removing any lanes. You would just have to move the perpendicular parked vehicles further under the superstructure. There’s a ton of space to work with. My “cost is no object” idea would be to hang an elevated bike lane off the #7 viaduct. This would parallel the #7 until Queensboro Plaza, then connect to the Queensboro Bridge via a flyover. Eventually you would extend the elevated lane along the length of Queens Boulevard. Wouldn’t a protected intersection design remove many fewer parking spaces? Why can’t we have a bike lane in Queens Boulivard in Sunnyside? It’s an okay design. Definitely for the protected curbside bike lanes. As for some of their “safety” improvements: meh. 2. Think harder at Skillman Av & Queens Bl. Going Manhattan-bound, it makes sense: mount the curb, avoid that sharp 90 degree turn and do it on the sidewalk instead. I’m for that. Going eastbound…no. At least when cyclists are returning, we cross over at a signaled crosswalk on Skillman Av, where most of the day there is a left-turn restriction for motorists. Now you want me to cross at an unsignaled crossing two blocks up? I’d say eliminate the two-way, and just make two separate protected lanes: one on the north side, one on the south side. Don’t know if anyone noticed but if you wanted to continue west on Skillman Av towards Brooklyn, you just got hosed because those sharrows have been erased. You’re probably gonna have to take the lane beforehand or do something to keep going straight. 3. Is the DOT open to revisions before implementation? Keehan-Smith says they don’t want it to be rushed, but what I’m looking at could very well be what’s implemented regardless. The DOT has been known to make no alterations to a proposal and submit to a community board for approval. I’m betting that, due to fatalities, the DOT will steamroll past the CB. There is a path in this (no pun intended) where the DOT implements a plan that the CB approves from the get-go and everyone comes out on top. Going eastbound…no. At least when cyclists are returning, we cross over at a signaled crosswalk on Skillman Av, where most of the day there is a left-turn restriction for motorists. Now you want me to cross at an unsignaled crossing two blocks up? This seems like an odd thing to complain about. That left turn at Skillman Avenue when coming from the bridge (travelling eastbound) always makes me a bit nervous, because cars travelling westbound on Queens Boulevard are free to turn right at the same time. At that crowded intersection with so much going on (shadows caused by train tracks overhead; disorienting latticework striping on the pavement), I don’t trust drivers to see me as they make the right turn. Whereas, under the new plan, the left turn for bikes at Skillman doesn’t cross the paths of the right-turning cars. We’d then skoot over to 43rd Avenue at a pretty calm location down the block, right after 43rd Avenue breaks off from Skillman. The lack of a signal there doesn’t bother me; indeed, the signal at Skillman and QB isn’t helping us by giving right-turning cars the green at the same time that we’re meant to be turning left, thereby luring us into a kind of booby trap. If you’re going to Brooklyn, you should not be using Skillman Avenue past 39th Street. The move is to go down to 47th Avenue, and take that avenue to rejoin Skillman well past the chaotic QB intersection. But, the sharrows on Skillman past that intersection with 47th Avenue have been removed, then that would indeed be bad. NYC council member Jimmy Van Bramer needs to appoint different people to Queens Community Board 2. Local boards of political appointees such as Queens CB2 do not represent the needs of their communities; the boro President and city council member who appoint the CB members need to appoint different people. Each person’s term is only 2 years, so with political will, these boards could be easily and quickly changed. Community boards have cancelled, delayed or watered down many good street improvement plans all over the city for years which is very discouraging. They are advisory only and the DOT does not need their approval but chooses to seek it. The DOT could choose instead of get approval from other community groups and organizations that actually represent the local area residents more accurately. The DOT should not tell this CB the number of parking spots that will be repurposed. Instead they should release the number as a percentage of overall spots in the neighborhood or along the route. People get upset at 158 spaces but if that were presented as a percentage it would be more acceptable. Maybe this means 1% less or some very small percentage. That’s the only number the DOT should release. And the DOT should be vague when asked for the number of spots and just always frame it as a small percentage of spots on the route. I wish they would too, it’s very dangerous. Council Member Jimmy Van Bramer, who has yet to take a position on DOT's plan, could put it over the top if he endorses the project ahead of the full board vote on Thursday. DOT should "move forward with pedestrian safety and protected bike lanes that will save lives," the mayor said in a statement. There's a DOT plan on the table to upgrade Skillman and 43rd with protected bike lanes, but momentum has stalled since it was first presented last fall.